China To Rebuild Great Wall With Gold! I’m sure you’ve heard, the U.S. government is shutdown and has put more than 800,000 federal employees on unpaid leave, closed National Parks and museums, and limited operations in various departments of varying degrees of importance. Another significant consequence of the shutdown is the affect it is having on the U.S. dollar. On Tuesday, the dollar index broke below the significant psychological level of 80 and was threatening to break further support at 79. The dollar was last below 80 in February of this year (see year-to-date chart below). Dollar weakness and gold strength go hand in hand, and over the long-term this inverse relationship has been a very reliable one. Over the short-term, however, it can and does violate the general rule for various reasons. For example, it has been less pronounced than usual since the Global Financial Crisis and hasn’t been evident at all over the last couple of months. Nevertheless, to support our point about the reliability of the inverse relationship, take a look at this longer-term chart that begins just after the painful divorce of the dollar and gold in 1971. Generally speaking, when the world is experiencing times of economic uncertainty or crisis, otherwise known as times of fear, other currencies usually flow into the U.S. dollar and treasuries because of their perceived safety. 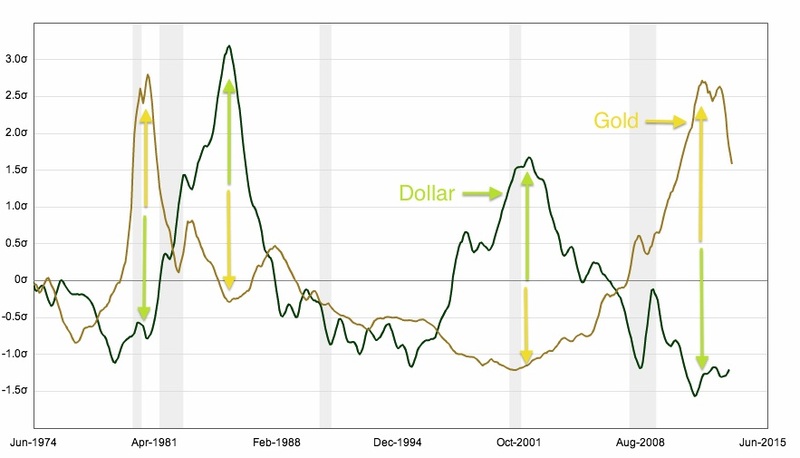 However, when real interest rates are negative and the U.S. is the source of market fear, wealth can flow out of dollars and into gold, hence the long-term inverse relationship. Therefore, a declining dollar tends to be linked to a rising gold price as people look for an alternate safe-haven to park their wealth denominated in dollars or other paper currencies. Speaking of people who are looking for somewhere to put their depreciating dollars, let’s talk about Apple’s $43 billion in cash! There are two points to mention at the outset of this discussion, China has over $1.7 trillion in U.S. dollar denominated securities and they have had a record breaking year of what is emerging as insatiable gold demand. Many respectable gold analysts and market observers predict that China will overtake India, the perennial gold medal winner, to become the world’s top gold consumer this year. As with any gold medal victory, a lot of planning, preparation, execution, and challenges accompanied China’s road to glory. Drawing from an excellent article we featured in our News Corner entitled “How China is Taking Over The World, One Gold Bar at a Time” let’s quickly run through some of the highlights of their modern history with gold. Although the Chinese are credited with inventing paper money in the 9th century, gold is ingrained in their culture much like it is for the Indians. Gold was originally chosen as money for the timeless characteristics it exhibits, which define a sound medium of exchange. The most important of which is the fact that it is in limited supply and its limited supply cannot be increased easily, thereby maintaining its value over time. This is in sharp distinction to its fiat currency stepbrothers. We start our brief history lesson in 1914 with the establishment of the Silver Dollar as the Republic of China’s national currency. Its circulation lasted until the mid-1930s, during which the Shanghai Gold Business Exchange became one of the Far East’s largest gold trading centers. However, in 1927 China plunged into civil war between the ruling Nationalists led by Chiang Kai-Shek and the disaffected Communist Party of China (CPC). The civil war lasted until 1950, taking a violent break between 1937 and 1946 to accommodate World War II and the horrors of a Japanese invasion. Between the Japanese invasion and the closing chapter of the civil war, which dominated the period between 1937 and 1950, China’s monetary story gets a little muddled as you might imagine. In the aftermath, the communist party comes to power with what one could describe as less than free-market ideas surrounding precious metals and monetary policy. For his part, Chiang Kai-Shek saw the Chinese characters on the wall and began, in 1948, shuttling gold reserves from the mainland to Taiwan where the defeated and exiled Nationalists set up shop. Over a 12 month period he expatriated roughly 3 million ounces of gold, worth roughly $4 billion in today’s dollars. Mao Ze Dong was leader of the victorious communists and under his regime gold was centrally controlled, bullion markets restricted, and private transactions in gold were outlawed. In the place of precious metals, and to keep up with the international Jones’s, the People’s Bank of China issued a new paper currency, the Renminbi. Try saying that fast three times. As the depredations of China’s communist era under Chairman Mao came to an end in the mid-70s, China’s gold market remained restricted but its mining sector awakened. In 1975, China mined 14 tons of gold. At the time, this only represented 1% of global production. However, it turned out to be a small snowball on a very steep hill. Fast-forward to 1995, China mined 100 tons of gold, which was a 715% increase over 20 years. The snowball got bigger! By 1978, China’s communist economic experiment had proven itself a complete failure, leaving a brutalized and impoverished country in its wake. Although the communist party remained, a more economically enlightened leadership came to power, headed by Deng Zhou Ping. Under Deng’s leadership, what has become known as the China Miracle began. It encompassed taking advantage of the one thing China had in abundance; cheap labor. They created free trade zones on the coast, inviting plentiful western investment capital to combine with their massive labor force to become the world’s largest manufacturing hub. At the risk of oversimplifying the matter, the new communist leadership was forging its own unique version of government that mixed free-markets in selected areas with centralized control. It remains very much a work in progress, but has certainly had its economic successes. The new leadership has also proven to be very friendly towards gold, though their actions have been slow and methodical in freeing and developing the market. However, their efforts have gained speed and grown in scope lately. If there was a point where China tipped their cap to future intentions, it was in 1993 when they changed the pricing mechanism for gold. They changed the pricing mechanism from a state determined one to a floating price representing an important shift towards an open gold market. The floodgates were now open and in 2000 China explicitly included language for the establishment of an open gold market in its 10th five-year plan. In 2001, the People’s Bank of China abolished the government’s monopoly of the gold market. In 2002, the Shanghai Gold Exchange officially opened and has regained its gold prominence after a 70 year hiatus. And in 2004, China classified gold as an investment and not only permits but actively encourages its citizens to invest their savings in gold. And the Chinese are some of the biggest savers in the world with a savings rate of 30%. Alongside establishing the necessary financial infrastructure to support and expand the gold trade, China continued to increase its gold mine production. In 2003, they mined 200 tons. In 2007, they surpassed South Africa to become the largest gold producer in the world. In 2009, they had reached annual production of 300 tons, and in 2012 they mined 400 tons. This year, they are expected to reach an historic 440 tonnes. China’s surge to gold mining dominance is quite a feat. Since surpassing South Africa, the once great gold mining country, they have not looked back. Even if they did, they are now so far ahead of everyone they wouldn’t be able to see anyone anyway! China’s 2009 production was just over 300 tonnes. The next closest competitor was Australia with just over 200 tonnes, representing just 66% of China’s total. Since 2009 they have increased their lead and in 2012 produced 120 tonnes more than runner-up Australia. On the production side, the country is simply in a league of its own. It is important to keep in mind that China exports little if any of their mined gold. Therefore, when you combine their mined supply with record gold imports, it’s estimated that they control at least 50% of the global gold market. In the last 3 years, their initiatives have intensified significantly. They have developed and invested in gold markets domestically and abroad. They have promoted and facilitated easier ways for their citizens to buy, sell, and store gold. And have formally declared, in their current 5-year plan, that developing the domestic gold market is a strategically important goal. That’s enough history, let’s get to the present. So far this year China has imported 730 tonnes of gold according to the World Gold Council. What’s worth noting is that they have imported record amounts during a period of time when the gold price has been falling. For example, when the price of gold fell a near record 9% in April, to below US$1,325, the Chinese came in and bought in unprecedented size. They imported 126 tonnes of gold for the month. On April 22nd alone the Shanghai Gold Exchange hit an all-time physical trading volume record of 43 tonnes in a single day. This was extraordinary! After the April price collapse, gold remained weak and performed another swan dive in June. China increased its purchases during this time frame as well. When gold was near its recent bottom in June and July, China bought an enormous 242 tonnes. Even with these massive purchases of gold, Chinese demand was overwhelming supply. This was in evidence as retail shops in major cities were inundated with long lines of retail shoppers waiting hours to make purchases. As a result, premiums skyrocketed as distribution bottlenecks became evident in the Chinese market. To solve this problem, China has recently announced plans to reduce regulations, which will allow a much greater number of gold traders to serve as import and export conduits. This action would lead one to believe that they expect this level of gold buying to be the new normal and, in true Chinese fashion, are planning accordingly. Aside from the record imports and production, China has also acquired $2.24 billion of gold mining assets outside the country this year. This includes recently bought mines in Western Australia, which according to Jim Rickards, is a strategic move. This is because they can refine gold produced in Australia at the Perth Mint and then quietly ship it straight to Shanghai, bypassing the London Bullion Market in the process to minimize any upward pressure on the international gold price (aka spot price). We wrote at length last week about the debt ceiling and QE-Infinity. This week, we wet your whistle with a brief discussion on the long-term inverse relationship of the dollar and gold. Both QE and a falling dollar are positive contributors to a rising gold price. However, the real story is surging and unprecedented demand from Asia, led by China. In prior articles, we have also covered the significance of India in the demand picture. Speaking of pictures, check out our chart below. It shows that when taken together, China and India consume an amount of gold equal to 82% of annual global mine production. We are certainly not the only ones taking notice. In a recent news story, Sean Boyd, CEO of major producer Agnico Eagle, said that he believes gold prices will increasingly be dictated by continued high demand from Asia and the flow of physical gold, and not the US based futures market. 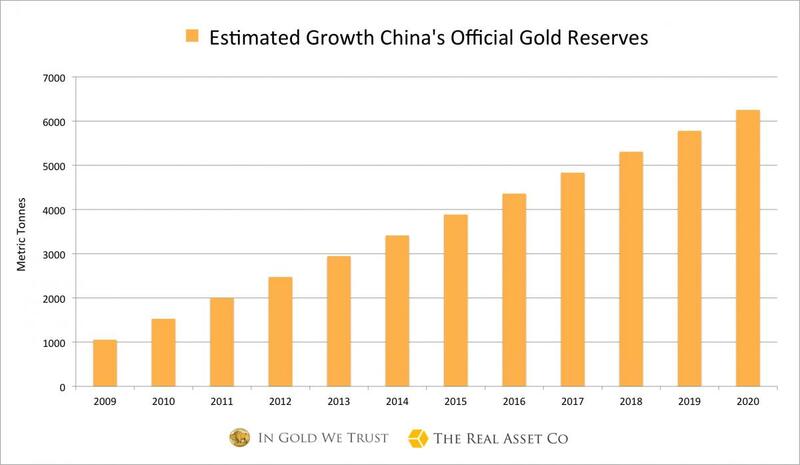 And just to give a little perspective on what continued gold demand from China could look like; we present this projected official gold reserves growth chart from Jan Skoyles, Head of Research at The Real Asset Co. The projection is based on the growth rate of these reserves in recent years. But keep in mind; this is just the growth rate of official gold reserves. 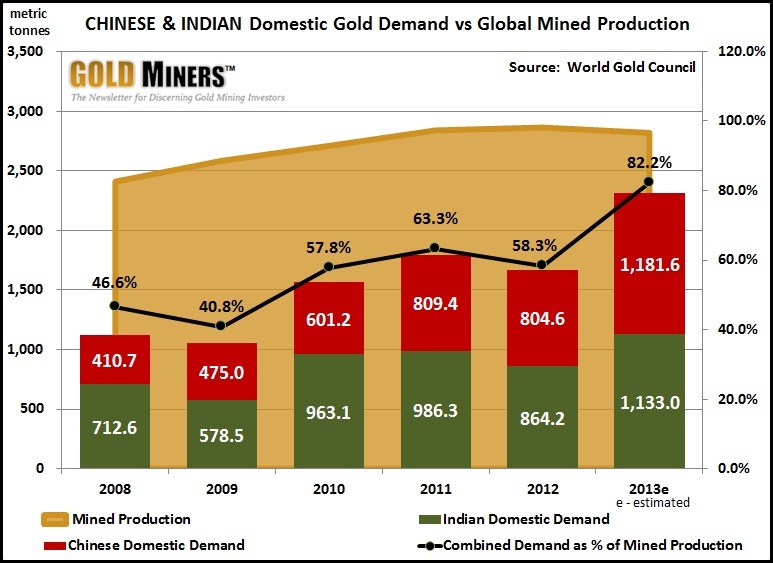 This chart does not include gold demand from Chinese citizens. It is simply meant to give you a perspective on the trajectory of gold demand. This is exactly what we have tried to frame in this week’s article. Demand from China will remain strong and persistent in the years to come, which we expect will be accompanied by a rising gold price. Therefore, China will likely be the reigning gold medal winner in the global gold game for some time to come. In our view, this is a good reason to get positioned in front of the surging tide by buying solid and deeply undervalued gold miners now, which are poised to strongly leverage a rising gold price.